[HENRY DU PONT]. 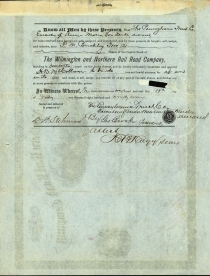 Printed Document Signed (“H. du Pont”). January 22, 1897. 1p. oblong quarto. The Wilmington and Northern Rail Road Company stock certificate. Being an issuance of 2 shares. Cancelled signatures, small paper loss from cut out cancellation, else Good. Henry Du Pont. Union officer during the Civil War and won the Medal of Honor. 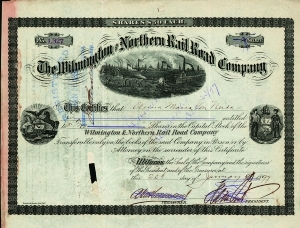 He was President of the Wilmington and Northern Rail Road Company; and a U.S. Senator.